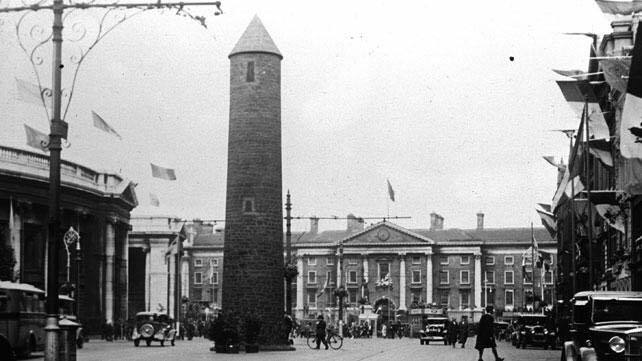 The Round Tower on College Green. | Come Here To Me! « A quick look at the ‘Keep Rovers At Milltown’ campaign. The Round Tower on College Green. 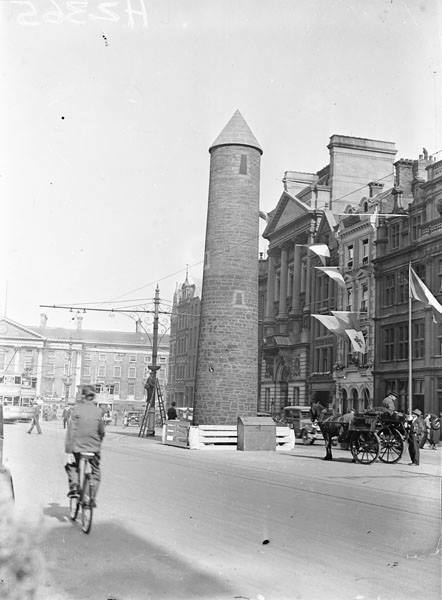 Round Tower in College Green, 1932. From Dun Laoghaire Harbour to the Pro-Cathedral, a distance of ten kilometers, there was an unbroken mass of people, compact, deep, on both sides of the route. In the city the pavements and the squares were completely covered by the multitude. Nor are to be forgotten the bouquets of heads in all the windows, and the daring spectators seated on the roofs of the houses. The Irish Times wrote that “Messrs. Watson of Killiney” produced the round tower, and that “no visitor, let alone a Dubliner, can readily miss this, as it stands some 45 feet high, on the site formerly occupied by the King William statue.” William’s statue had been subject to many attacks, in fact one publication went as far as to say “It has been insulted, mutilated and blown up so many times, that the original figure, never particularly graceful, is now a battered wreck, pieced and patched together, like an old, worn out garment.” An explosion in November 1929 led to its removal from College Green, where it had stood since 1701. 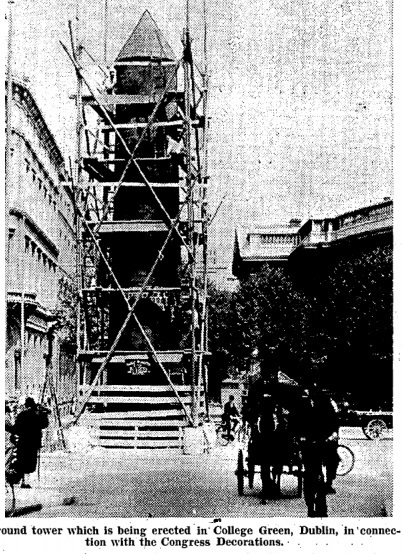 The structure was only ever intended as a temporary one. As Norman Vance has written, “Post-independence Catholic triumphalism encouraged the identification of ancient Ireland with Catholic Ireland.” So, was it “vulgar tourist kitsch” or something of artistic merit? Regardless, it is certainly difficult to picture it today, sitting halfway between the waxworks on one side and Abercrombie and Fitch on the other! Any idea where the other one was? .